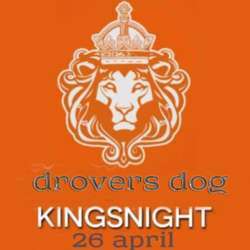 Come to join us for the the KingsNight Party @Drovers Dog. Just like New Year starts with a grand celebration on New Year’s Eve, King’s Day party is on from King’s Night the day before, on 26 April. With more than 1 million visitors coming for the best festivals and events of the year on King’s Day, Amsterdam turns into a huge ORANGE citywide extravaganza. You are welcome to join us for a KingsNight dinner from 18:00. The Drovers Dog Burger Special deal includes a beef or veggie burger + glass of wine or beer for the price of €12. At 22:00, DJ will take us into the KingsNight. **Please note: Drovers Dog takes PIN ONLY! We encourage you to bring your friends, but please invite them to sign up for InterNations first. Looking forward to seeing you all on 26 April.